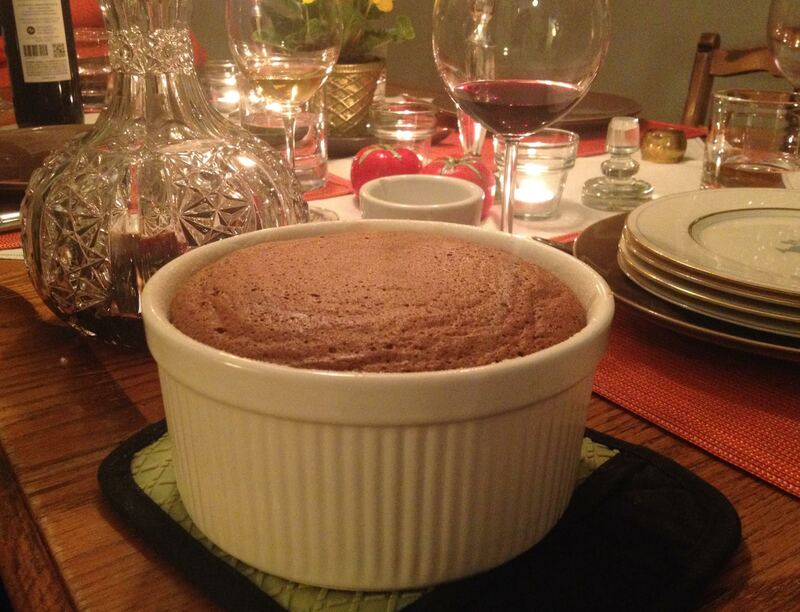 There’s nothing like chocolate to end a meal and nothing (well almost nothing – a little romp in the sack can go a long way here) more magnificent than to pull a soufflé out of the oven and present it at the table. And then my French friend, Alain, speaks about the crisp, and then the hiss – the sound that’s made when spooning out the first serving. It’s beautiful, exciting and delicious! Just like I hope your Valentine’s Day turns out to be! Make this chocolate soufflé for dessert, with LOVE and it will be the perfect way to end a Valentine’s Day dinner. This recipe is from Mark Bittman, originally printed in the NY Times, and it is super easy and the very best part is that you can make this in the morning, keep it refrigerated and bake it while you’re eating your main course and it will be ready in about 25 minutes! Now the soufflé won’t rise quite as much this way, but who cares? The trade off of not having to jump up and make the whole thing after dinner is well worth it. And it’s even gluten-free as there’s not a speck of flour in it. Now Mark says this recipe serves two, but I say it really serves four. You can’t make it smaller as you can’t have one and a half eggs, right? So make this for the two of you but know that you can also use this recipe to serve four. I don’t have a picture of the serving, but I want to tell you that I garnished it with a whole strawberry to add a little color. It was beautiful. Raspberries are also nice. 1/4 tsp. cream of tartar. Preheat oven to 350 degrees. 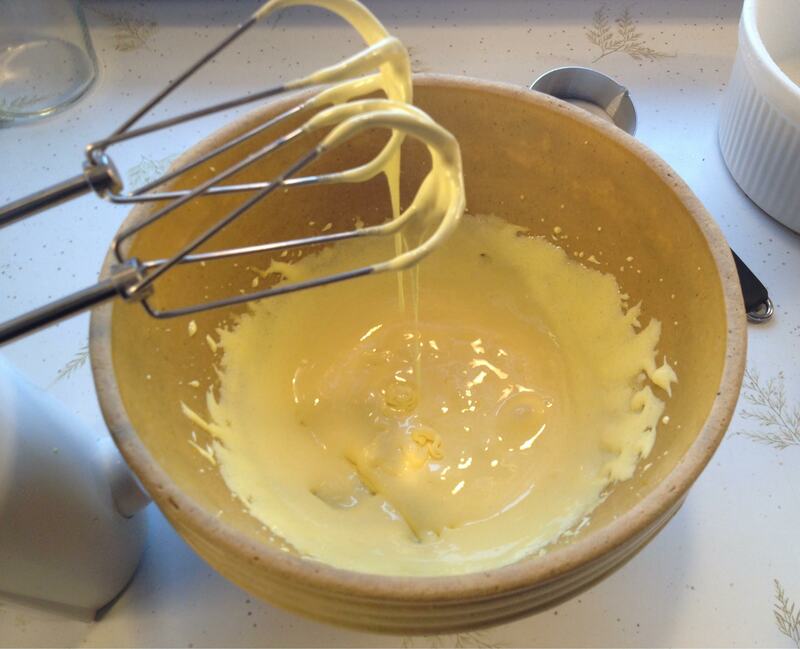 Butter one 4-cup soufflé or other deep baking dish. Sprinkle with sugar, invert it and tap to remove excess sugar. Wash beaters well, or use a different set, then beat egg whites with salt and cream of tartar until whites hold soft peaks; continue to beat, gradually adding remaining tablespoon of sugar, until they are very stiff and glossy. Stir a good spoonful of whites thoroughly into egg yolk mixture to lighten it; (egg yolk mixture will have become very stiff so this step is very important) then carefully fold in remaining whites, using a rubber spatula. Transfer to prepared soufflé dish. At this point you can cover with plastic wrap and refrigerate until you are ready to bake. Bake until center is nearly set, 25 to 35 minutes. Serve immediately. How true that there’s nothing like a good chocolate dessert! This looks fantastic, Mary. Thanks Angie!! I LOVE chocolate!! I was going to post about a chocolate souffle but I farted around too long and the darn thing began to collapse and wasn’t beautiful, so I ate it. 🙂 Yours is amazing! LOL!!!! You are too funny Maureen!! Happy V-day!! This looks amazing Mary! You’re right… the perfect finish to a V Day dinner! I’ve never made a souffle before, but now I am tempted to! I hope you had a great Valentines Day. Pamela – this is super easy. I do hope you give it a try! I agree – thank you Charlie Louie!! Yup chocolate souffle gets me every time. And we won’t even go into what it does for Mrs KR! Haven’t made one of these in ages. Need to again — and I’ll use this recipe. Really nice — thanks. Juliana – this is super easy. I do hope you’ll try it! Hi Mary, what a great dessert to finish off a meal here, looks delicious! So true Lorraine!! I hope you’ll get to try it! Laila – this is so easy – don’t wait – please make it soon! !